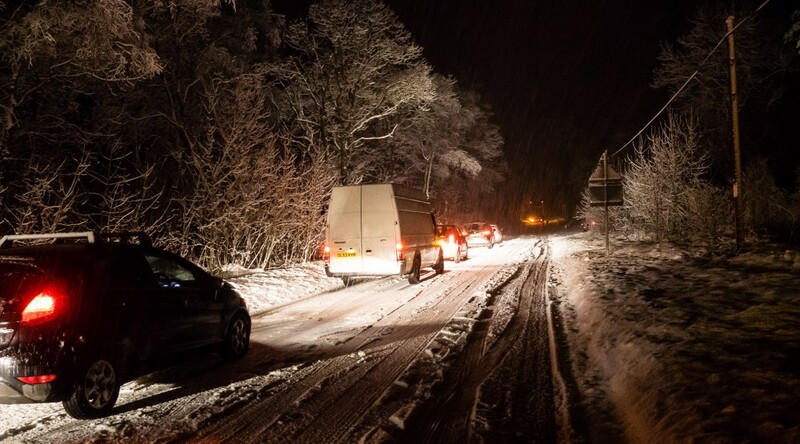 So, this evening we were heading home – conditions moderately crappy, but all was well, until we reached the Pass of Leny, where we joined the back of a long and unhappy queue. After half an hour of thumb-twiddling, a stroll to the front revealed that: one articulated lorry had got stuck on the rise to the blind ridge; the following lorry driver (see photo for registration number), rather than thinking, “He’s stuck, I’m driving a similar vehicle, so I’ll wait and see what happens”, thought, “it can’t happen to me” and went to overtake, on the rise to said blind brow. Of course, he a) slid into the vehicle he was overtaking b) got wedged between that and the roadside barrier and c) blocked the road completely. It was just luck that no-one went head-on into him.